Those who are new to the hiking and camping game can sometimes be overwhelmed by the terms associated with the activities. Reading product descriptions or how-to guides can be confusing when you’re unclear on what certain outdoors-related words mean. I’ve been there before and I know the potentially hairy situations that can arise due to a simple misunderstanding of jargon. For this reason, today I’ve provided a list of common camping terms to commit to memory whether you’re shopping for gear or hitting the trail. 3-Season tent: A tent recommended for use in summer, spring, and fall. 4-Season tent: A tent designed to handle any weather conditions, including harsh winter weather. A-frame: A basic tent shape, the cross section of which resembles an “A”. Bear bag: In bear country, campers must take measures to safeguard their food and cooking utensils. Food items are placed in a strong, waterproof bag (the bear bag), tied to a rope and suspended out of reach. Bench mark: A permanent object that is either natural or man-made with a known elevation that can be used as a reference point when navigating. Bivy sack: A small one-man tent or bag of sleeping bag proportions often used for emergency shelter. Bushwhacking: Making one’s way through bushes or undergrowth without the aid of a formal trail. 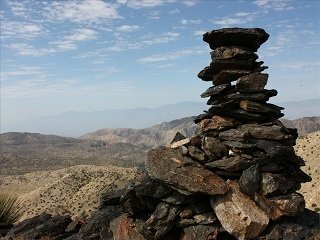 Cairn: A stack of rocks used to mark a trail’s route through areas devoid of trees. Canopy: The inner wall of a double-walled tent. The canopy is breathable; the outer wall, or fly, is waterproof. Deadman: A log or rock buried in the ground to provide a solid point for anchoring a tent in ground too soft for stakes. Dome: A tent shape where the poles create a dome by curving over each other. Footprint: The shape and square footage of a tent floor. Gaiter: A water-repellent, internal sleeve that can be tightened around boot and lower leg to keep out snow. Loft: The height and thickness of insulation in a sleeping bag. Mummy bag: A close fitting, shaped, hooded sleeping bag very efficient at conserving body heat. Rating: The degree Fahrenheit to which a sleeping bag is constructed to sleep comfortably. i.e. -30 degrees, 0 degrees, +15 degrees. Shell: The outermost material in a sleeping bag or outdoor clothing, consisting of a fabric used to meet a particular demand such as abrasion resistance, water repellency or suppleness. Stay: The backbone of aluminum or plastic material supporting an internal frame backpack. Ultralight tent: A tent designed for one or two people, weighing five pounds or less and designed to carry on or in a backpack.